There has been a ridiculous amount of news this past week about portable hard drives of the 2.5-inch variety. OWC introduced a 160GB 7200rpm portable. Samsung did one better announcing a 200GB 7200rpm 2.5-inch drive, but that was a tease: It would initially only be available to enterprise customers. 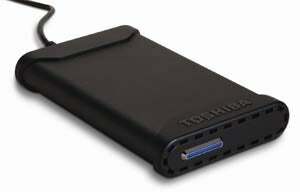 Today, Toshiba unveiled a 200GB USB-powered 2.5-inch portable drive, for the reasonable price of $230. It's got a sweet black finish and a ruggedized case, and like I said, it draws power from the USB jack so you don't need to carry around an extra AC adapter. There is one hitch, though, something not mentioned in the press release or other reports: More than likely, the drive spins at 4200rpm. If you've been in need of an ultraportable cyclone of crazy A/V data access, you're just gonna have to settle for 160GB or wait some more. Sorry.